It's been a while since I made a bundt that didn't contain fruit, so I decided to embark on operation 'spicy bad boy'. This one takes a while, so it's best made when you have plenty of time, like a bank holiday weekend! 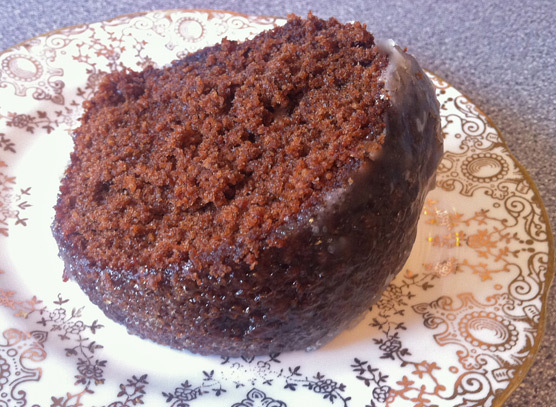 This cake is light as a feather but has depth of flavour and a sticky outer edge. The best bit is, it matures the longer you leave it... if you can. This is based on a recipe that I found in Olive magazine a few months ago, but I have amended it a little. Prepare a 10 inch fluted tube or bundt tin by greasing and dusting with flour. Tap the tin to remove any excess. Heat slowly until everything is smooth and melted. Add the crystallised ginger and Guinness. You need to raise the temperature - stop just before it starts boiling. Take the pan off the heat and tip in the bicarbonate of soda - whisk like billyo! Before your very eyes the mixture with froth and foam. Chill out. It will stop growing. I promise. Leave to one side. Whisk the eggs in a jug. In a large bowl, sift the flour, baking powder and spices. Stir the egg mix into the flour mix - it will be a thick paste. Do not panic. Add the syrup mix in three stages. This will help get a smooth mix and prevent an unholy mess. The batter will be very runny. 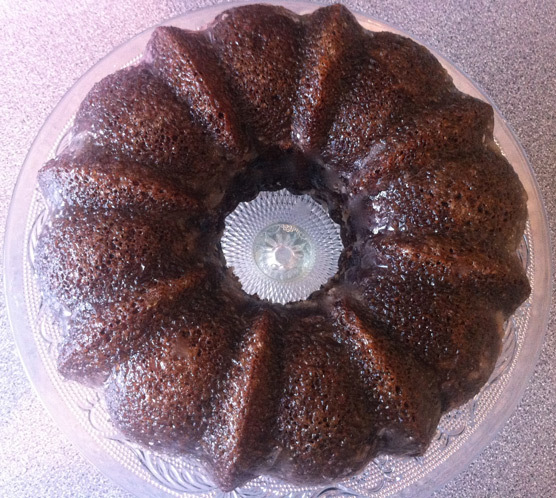 Again, although this is very different from an average bundt mix, it is ok! Pout the mix into the prepared tin. Bake in the middle of the oven for about 45 minutes. After this time, if a skewer doesn't come out clean, give it another 5 minutes. Here's the bit that will throw you. You need to remove this bad boy from it's tin. NOW! No cooling whatsoever. (Be really careful - bundt tins get really hot! I am speaking from experience unfortunately...) The best way to do this is to cover a plate with greaseproof paper and put that on top of the tin, then flip it over. The cake becomes very sticky, so the greaseproof helps when manoeuvring later. Leave to cool before putting in an airtight box overnight. The next day (here's one I made earlier...) Preheat the oven to gas 4/170 C.
Lift the cake (on its greaseproof paper) onto a baking tray. Warm the ginger preserve in the microwave for about 15-20 seconds or until runny. Brush it over your cake with a pastry brush. Put the lemon juice in a pan and heat until just starting to boil. Quickly mix in the icing sugar. Note: it should be really runny. If it isn't loosten it with a little more lemon juice. You should be able to brush it over the cake easily. Brush the cake with the glaze and then pop in the oven for about 5-10 minutes. The glaze should go clear. It's worth turning it half way to get it looking even. Don't worry if there are still white bits. It adds to its cakey charm! This cake will keep for about 5 days. I can't eat chocolate... get a rash on my arms and chest :o( What would work instead of that in the ingredients? I'd just leave it out. 75g is actually a really small amount when you see it! This sounds delicious :). I'm saving this recipe for autumn.